The Classy Closet is located inside the offices of When Help Can't Wait at Broadmoor Plaza in Martinez, GA. Many of Augusta’s best dressed women, happily donate things to us that they no longer wish to wear. Many items come in unworn with the tags still on them. Typically in stock may include Chico, Talbot, Diane VonFostenberg, Liz Claiborne, and Chaas. All are in like new condition. The Classy Closet is well known for the beautiful designer labeled purses and bargain shoes (some are new, still in the box). Ladies love accessories. Chic accessories are the easiest way to update a look and now it’s a piece of cake to find items that you love at prices you can afford. Just come see us at “The Classy Closet” and help our local nursing home residents at the same time! Some of our Clothing is Vintage – Some is Designer Label – Some is NEW, unworn with original tags, some gently used. We have an eclectic mix of all sizes. Much is newly dry-cleaned for your comfort. Sizes range from small-petite to plus sizes. Many are European sized which require one to try them on – and for that we have a nice dressing room for your convenience. Our stock changes daily, so stop by often! “The Classy Closet” was established as a fund-raising entity for When HELP Can’t Wait. (WHCW). WHCW is a non-profit dedicated to supplying much needed comfort and convenience items to nursing home residents throughout and beyond the CSRA. 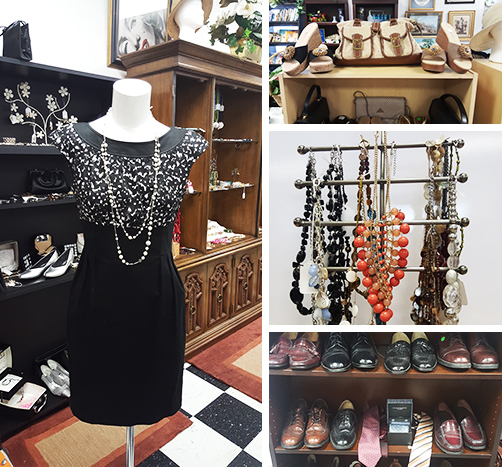 With no major supporters and being an all-volunteer organization, the cost to operate is done through fund-raising efforts like ‘The Classy Closet”. All items are donated and all profits are used to support the ministry to nursing home residents in need. There are no large Administrative salaries paid at WHCW.